On the loose and considered extremely dangerous! land snails in the world. There is a very large (and often illegal) "Pet Trade" for these snails even thought it is illegal to keep them in many countries! Where to be on the lookout! This snail (a native to Africa) has been widely introduced to the USA (mainland & Hawaii), to Asia, to the Pacific and Indian Oceans Islands, to Brazil, and to the West Indies. It can be found roaming freely in such habitats as agricultural areas, coastlands, disturbed areas, natural forests, planted forests, river and stream banks and, scrub/shrublands, urban areas, wetlands ...in other words, almost everywhere they are established and wish to reside. 1. Achatina fulica is the largest and commonest giant African land snail, and although originally from East Africa is now distributed throughout the tropics. It may reach maturity in captivity in just over one year but this can take four or five years in the wild. It lays small yellowish white eggs about 4 mm in diameter. With a shell length averaging in adults at 250 mm the snail weighs about 250 grams. The shell is a brown colour with weak darker markings that appear as bands across the spiral. The mantle, the fleshy part inside the shell through which the foot protrudes, is a pale yellowish colour. The columella, the smooth inner surface to the opening of the shell is also yellow. The ‘head’ portion of the foot is light brown but the rest of the foot is paler with thin net-like markings. 2. 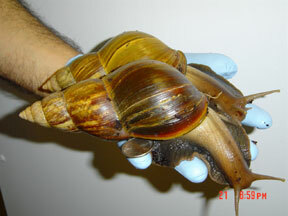 Archachatina marginata is again about 200 mm when full grown. The shell is much less pointed than the Achatina species and this ‘roundness’ is especially obvious in young animals. The columella is white and the eggs are comparatively large at 17 x 12 mm. The striation on the shell may give the appearance of a ‘woven’ texture, especially when looked at under a magnifying lens. The head is a dark grey but the rest of the foot is a lighter shade. Its ranges from Zaire to the Ivory Coast. The snails’ ability to eat virtually any form of plant material combined with their capacity to build up large populations rapidly, means that they can be serious agricultural pests. Indeed, in suitable habitats the snail is able to maintain populations averaging 150 per square meter. 3. Achatina achatina grows to about 200 mm and has a much more patterned shell than Achatina fulica the shell is slightly more yellow with distinct brown jagged bands. On the shell can be seen striations that are distinctly and regularly broken. The columella is purple and the eggs are about 6 mm in diameter and obviously yellow in colour. This species comes from West Africa from Liberia to Nigeria. Giant african land snails contain both male and female reproductive organs ( called hermaphrodites - This does NOT mean that they can mate with themselves, they still require a partner). After a single mating they can produce a number of batches of fertile eggs over a period of months. They can lay as many as 100 to 400 eggs in a single session , and can lay up to 1,200 eggs per year. Average about 5-6 years, but can live up to 10 years. Many GALS are voraceous plant feeders and can be very destructive to landscape and homes. 1. Giant African snails have a voracious appetite. They are known to eat at least 500 different types of plants, including peanut, beans, peas, cucumbers, and melons. If fruits or vegetables are not available, the snails will eat a wide variety of ornamental plants, tree bark, and even paint and stucco on houses. 2. Giant African Snails are carriers of the rat parasite, Angiostrongylus cantonensis. This parasite can be contracted by ingesting improperly cooked snail meat or by handling live snails and transferring snail mucus to the human mucus membranes such as those in the eyes, nose, and mouth. (For information, see http://www.cdc.gov, or call your state health department). GALS can also carry several other human pathogens and parasites. 3. When these snails are introduced into a nonnative environments, they can reach such enormous numbers they can become a serious conservation problem as well. They may eat native the plants modifying that habitat and they probably also out-compete native snails. 4. Often on these snails being released into an environment, man has purposefully introducted other predatory snails and flatworms as biological control agents. These species then too may have devastating effects on native land snail diversity and that ecosystem as well. Guiness World Book of Records: The largest known land gastropod is the African giant snail (Achatina achatina), the largest recorded specimen of which measured 39.3 cm (15.5 in) from snout to tail, with a shell length of 27.3 cm (10.75 in) and weight of 900 g (2 lb). Giant African land snails are illegal in the US and many other countries due to their potential as a devastating invasive species. They are highly invasive, and can cause extensive damage to important food crops and other agricultural and natural resources. In the USA, Giant African Snails are strictly prohibited from entering the United States and they will be removed when discovered. GALS are legal pets in many places, However, under no circumstances should they be kept as pets where illegal to do so. If you do have a pet African landsnail, never ever release it or it's offspring into the wild. NOTE: they are prolific breeders so if you have more than one you also need to be extremely careful about disposing of the numerous eggs produced. The U. S. Department of Agriculture's Animal and Plant Health Inspection Service (APHIS) is interested in finding these snails, and encourages those using these snails in classrooms, nature facilities, or keeping them as pets to turn them in voluntarily without fear of penalty. If you have a giant African land snail PLEASE DO NOT RELEASE IT INTO THE ENVIRONMENT OR GIVE IT AWAY; OR, or if you find giant african land snail, PLEASE report it to your State Department of Agriculture (you will find this office listed under State government in your phone book, or on the web at: http://www.aphis.usda.gov/npb/npbmemb.html#Members), or to the US Department of Agriculture Animal and Plant Health Inspection Service office in your state (you will find this office in your state listed under Federal or U.S. government in your phone book, or on the web at: http://www.ceris.purdue.edu/napis/names/sphdXstate.html). At the present time snails found in the United States have not been shown to be disease carriers. For more information, see the following web site: http://www.cdc.gov/ncidod/dpd/parasites/angiostrongylus/factsht_angiostrongylus.htm. List of Pests Regulated in Canada: Canadian Food Inspection Agency: Plant Products Directorate: Plant Health Division: In order to protect Canada's resource base the following pests are regulated. Pests in this list are linked to the policy directives that are available electronically from 1994 on, but some may also be referred to in directives dated prior to 1994. The list may be revised at any time. NOTE: African Land Snails are on the list! By not having these snails as pets or by voluntarily handing in those you may already have and by reporting any wild-found snails to the appropriate authorities you will be helping to control one of the world's most destructive snails. Consequently; you will be part of the solution not the problem and YOU WILL FEEL GOOD! Other Giant African Land Snail Species: Besides the species listed below, there are many more species to be found in other countries. Only the three discussed above are normally kept as pets. Achatina achatina (Linnaeus,1758) ...Liberia-Nigeria (Giant Ghana Tiger Snail) . Thay are the biggest land snails on the Earth. Their dark-yellow shell with irregular dark-brown "tiger" stripes can reach 17-30 cm long. Their body is dark-gray. Achatina fulica (Bowdich, 1822) ... East Africa (and very widely introduced throughout worldwide tropics). (Giant East African Snail) They are the biggest and the most common Achatina snails. Large shell cone-shaped shaped snail. Achatina fulica rodatzi (albino shell) - have light shell and dark body. Achatina glutinosa...Nyassaland - They are smaller Achatina snails with a brown shells. Achatina iredalei (Preston, 1910)...- (Albino land snail) They are viviparous (bear live young) snails with a lemon-yellow shell. Achatina reticulata,,,Tanzania; Zanzibar - They are rather big snails with a striped shell. Achatina varicosa (Pfeiffer, 1845) ...South Africa - They are smaller snails with a striped shell and stripes running along their body. Archachatina marginata (Swainson, 1821) ...Cameroon-Zaire - ("margie" ,Giant West African Snail) - Their shells can reach 15-17 cm long. Their body is chocolate-coloured; a head is almost black. There are some snails with a light body. The top of shell is round. They lay 3-10 eggs, about 2 cm each. Conchologists of America: "A New Old Problem"